Click here to purchase pre-sale tix! Now $20. Express entry. featuring UK's Punjabi Hit Squad LIVE! West London based DJ/Producer collective - Punjabi Hit Squad - will perform LIVE in Chicago for the very 1st-time over Labor Day Weekend! Get ready to dance to classic tracks like "Hai Hai" and newer hits like "Tera Pyar" and "Deewana"! Chicago will be the only city on this tour! 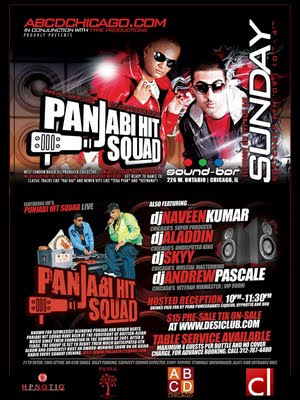 Known for seemlessly blending Punjabi and Urban beats, Panjabi Hit Squad have been at the forefront of British-Asian music since their formation in the summer of 2001. After 8 years, the group is set to debut their much anticipated 4th album and currently host an award-winning show on UK Asian Radio every Sunday evening. Also featuring Chicago Super Producer, DJ Naveen Kumar and Chicago's Undisputed King, DJ Aladdin! DJ Andrew Pascale will be spinning House, Hip-Hop & Club trax in the VIP Room all night long! Table service available. Maximum 4 guests per bottle and no cover charge. For advance booking, call 312-787-4480. 21 to enter. Chic attire. No gym shoes. Valet parking. Capacity crowd expected. Early arrival strongly encouraged. Alley-side entrance only.